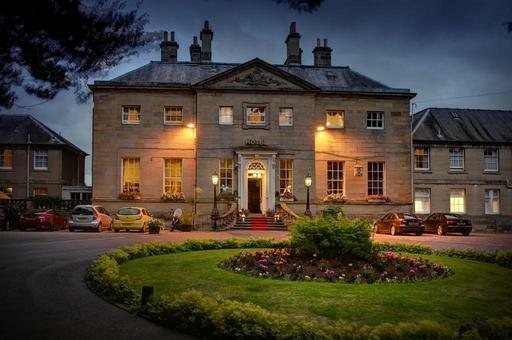 Blessed with an ideal situation on the banks of the River Tweed in the centre of Kelso, Ednam House Hotel is an elegant Georgian manor house dating from the 1760s. All 32 bedrooms are individually designed in traditional Scottish style and come in a variety of shapes and sizes. Some rooms enjoy gorgeous views over the river; all are fully equipped with luxury linens, flat screen TVs, desks and tea and coffee making facilities. For an extra special comfort, the exquisite Orangery Suite has a separate lounge area for relaxing and soaking up those river views. The Riverside restaurant is aptly named – expect panoramic views of the Tweed as you dine on salmon sourced from the river below. In additional to the fresh local fish, the chef sources a variety of regional ingredients such as Scottish beef or pheasant to create imaginative takes on traditional favourites. Light bites such as salads or sandwiches are catered for in the Pharlanne Delicatessen, located at the front of the hotel. The cosy and well-stocked bar is another option for informal dining over lunch and dinner. Ednam House overlooks Junction Pool, one of the most celebrated salmon fishing spots in the world, so it has long been a favourite with anglers. In addition to the renowned fly fishing, Ednam is also perfectly situated for Kelso Racecourse, excellent shopping in the town’s independent boutiques, visits to Floors Castle and a host other nearby stately homes, not to mention explorations of the unspoilt countryside of The Borders.